on board the 49 passenger motor sailer "Galileo". Experience a harmonious balance between conventional cruising and private yachting, along with an exciting voyage of discovery in Greece, unravelling the wonders of the Cyclades islands. 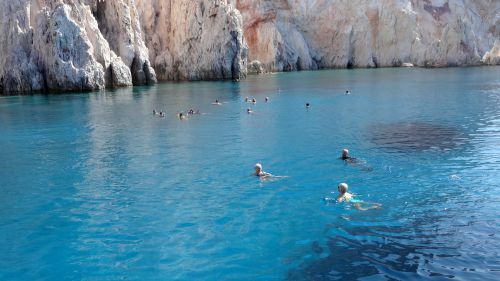 Each day you will discover a new port of call, a hidden cove with crystal blue waters to cool you, a glimpse of ancient history to amaze you and rich cultural diversity to intrigue you. Sail for Poros for a short 3 hours visit, before set sail to Poliegos. Overnight at sea. Morning arrival in Poliegos, a very small island known for its amazing beaches. Morning swim stop followed by a BBQ on deck. Afternoon sailing to Folegandros, one of the most amazing and less known islands in the Aegean Sea. Walk the amazing Upper City and dine at one of the traditional Greek tavernas. Overnight in Folegandros. Morning arrival at Santorini (occasionally at anchor) to explore its unique capital Fira and experience the stunning natural drama of the volcanic caldera. Optional excursion to the archaeological site of Akrotiri and a tour of the villages including the small beautiful village of Oia known for its breathtaking view over the caldera. Overnight in Santorini. In the morning you will enjoy a swim stop in an enchanting bay of Antiparos. Early noon arrival in Paros. Visit Parikia and the quaint village of Naoussa. Time to have a fun night and show us your dancing skills during our famous Greek Night. Overnight in Paros. After a morning swim we will arrive in Syros, the capital of the Cycladic islands, where you can enjoy one of its beautiful sandy beaches or walk through the town and enjoy the unique architecture of the buildings. Overnight in Syros. In the morning we will arrive in Kythnos where you will enjoy a swim in Kolona bay. 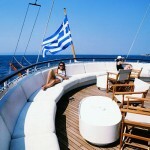 We will then set sail for Marina Zea where we will arrive in the late afternoon via Cape Sounion, the temple of Poseidon. Overnight in Marina Zea. 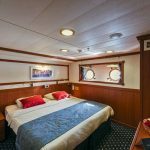 Itineraries can be changed at the discretion of Variety Cruises and of the vessel's Captain in case of adverse weather conditions (winds of 6/7 Beaufort or more depending on the vessel), on port authorities not allowing a vessel to leave port, or in case of other extraordinary conditions. This cruise went above and beyond our expectations. Even though strong winds forced a change in our itinerary, we were very happy with how it all turned out. Swimming off the ship in the Aegean Sea is pure bliss! We highly recommend this cruise by Variety Cruises. Excellent service from point of initial contact through purchase and further questions. Very very happy. The trip itself was very well managed and there were nice little touches. The staff were fabulous. Definitely like to book again.